Michael Caine has often talked about how he came up with the name Harry Palmer for the working-class hero of The Ipcress File. The character, a nondescript spy, was unnamed in Len Deighton’s novel and its sequels. Caine, figuring a nondescript man deserved a nondescript name, decided on Harry, the dullest name he could think of — momentarily forgetting that the film’s producer, who was sitting across the table from him at the time, was Harry Saltzman. As for Palmer, said Caine, that was the name of the most boring boy at his school. Personally, I’ve always thought Harry was a roguish, devil-may-care kind of name. Some of the most famous characters from the silver screen are Harrys: Harry Potter, Dirty Harry Callahan, The Third Man’s Harry Lime — which is also the name of Joe Pesci’s inept burglar in Home Alone. Barry, however, is entirely another matter. There might be just one letter in the difference, but (and I say this with apologies to the few Barrys I’ve known over the years), it’s right up there with John and Pat as the most humdrum of names. Imagine Barry Palmer, Barry Potter, Barry Callahan or Barry Lime (which sounds more like a brand of tea than a person). Can’t, can you? But it’s the sheer, unthreatening banality of the name that makes it perfect for the protagonist of Bill Hader’s cracking new HBO comedy series, called simply Barry. Last Thursday, while the world was obsessing over season two of The Handmaid’s Tale, Barry made a low-key arrival on Sky Atlantic and immediately staked its claim to be the best new comedy of 2018. 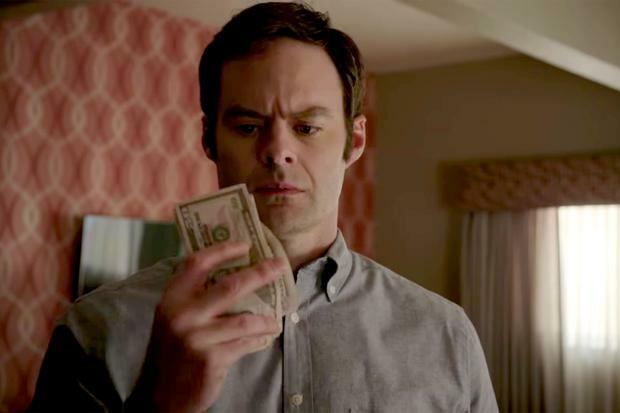 Hader, who co-wrote the series with Silicon Valley’s Alec Berg and directed the first few episodes, plays Barry Berkman, a US marine-turned-professional assassin who believes there must be more to life than just killing people. Returning to Cleveland after his latest job, Barry tells his employer Monroe Fuches (Stephen Root), who also happens to be his uncle, he’s depressed and wants to do something different. Reluctantly, Barry takes on the latest job Fuches has found him, which involves travelling to Los Angeles to kill a personal fitness trainer called Ryan Madison (Tyler Jacob Moore), who’s been playing around with a Chechen gangster’s wife. Wearily tracking his target, Barry discovers Ryan is also an aspiring actor and ends up following him into an acting class run by dubious Method guru Gene Cousineau (the wonderful Henry Winkler). Mistaking Barry for a new student, Gene halls him up on stage to run though a scene from True Romance with Ryan. Barry is as wooden as a coffin, but the feeling of being in front of an audience ignites a light in his dead eyes and a flame in his heart. He’s been bitten by the acting bug — and had his hitman’s heart melted by lovely fellow student Sally Reed (Sarah Goldberg). He’s soon hanging out with the other actors. But he’s still got a job to do: kill Ryan. When the Chechens get tired of waiting, they kill Ryan themselves, then try to kill Barry, which of course means Barry has to kill them, which he does with ruthless efficiency, opening up a whole new can of worms for episode two (which I’ve already seen). Mixing comedy with drama is tough; mixing dark comedy with strong violence (the first shot we see is of a man with a bullet hole in his forehead) is even tougher to do well. The only series that’s successfully pulled it off so far is Fargo. Barry pulls it off too, in the process delivering plenty of laugh-out-loud gags, as well as genuinely suspenseful moments. Hader and the rest of the cast are excellent, but it’s a particular joy to watch Winkler, who brings expertly honed comic timing to the party and seemingly channels every pretentious acting coach he ever met. Barry is on Sky Atlantic tonight and Thursdays at 10.45pm.